CocoRosie: Mystic Sisters Bianca and Sierra Casady make strange but beautiful music together as CocoRosie. Imagine a cabaret interpretation of J.R.R. Tolkien and you're getting close. Listen to the siblings perform four songs from their new album, Grey Oceans, on KEXP. One minute into CocoRosie's live session, I felt like I was in a lush forest on a bed of velvety moss, with a brook babbling nearby and sunlight filtering through the treetops. I had gone to a happy place, and it was pure enchantment -- I was under the duo's spell. 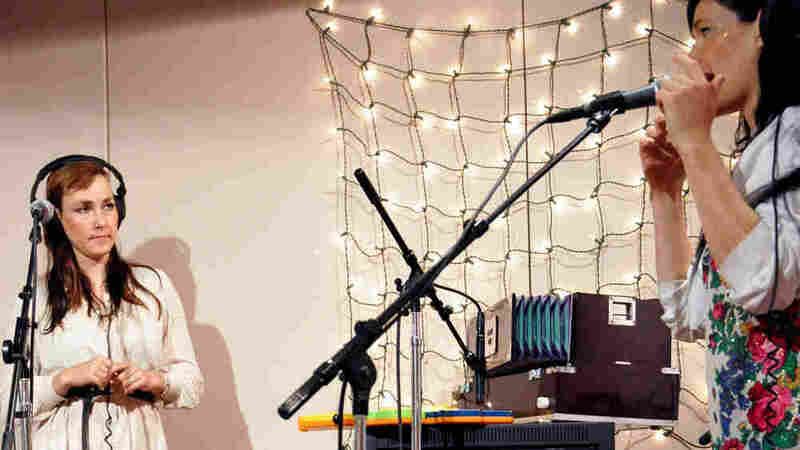 CocoRosie performs live at KEXP in Seattle. The creative genius of sisters Bianca and Sierra Casady was on full display at Seattle's KEXP when they performed gorgeous renditions of songs from their latest album, Grey Oceans. The emotion they exuded and the sheer beauty of the music took my breath away. CocoRosie's music is unusual -- many would say challenging. Piano, acoustic guitar, harp, toy instruments and flute (though it might actually be a penny whistle) are backed by static-ridden samples and pre-recorded beats. It's a captivating marriage of traditional sounds with modern electronics. As the sisters trade lead vocals back and forth, the contrast is stark: Bianca's voice is creaky, childlike and compelling, while Sierra is a trained opera singer. Her pure, majestic voice soars. The lyrics exude twisted innocence. In one of my favorite new songs, "Lemonade," the beauty and fragility of the music and childlike vocals belie the intensity of the words, which tell a somewhat autobiographical story of the sisters' unconventional childhood. I'm not the first to use the term "otherworldly" to describe CocoRosie. But it's an apt description -- I'm carried away every time I hear the pair perform live. Everything else fades away, and I'm transported to a world of CocoRosie's creation. And I could not be more delighted.